Today was a tough day in the International main event: teams were going to be eliminated from the tournament. Between Na’Vi, Cloud9, IG and LGD, two teams were destined to have their International dream come to a halt. For those stung with disappointment, there was always the All-Star game to fall back on, and boy did Valve deliver. Spoilers ahead as I dissect day two of the Dota 2 International main event. Game one between Na’Vi and Cloud9 was surprising, in the sense that Na’Vi just didn’t seem to perform as expected. Na’Vi had a sensible draft: Faceless Void using his Chronosphere to set up Elder Titan and Lina to blow Cloud9 up. The execution however was sloppy. Cloud9’s Doom pick kept tabs on the Faceless Void, while KuroKy on Lina failed to land any of his spells. Every team fight went the way of Cloud9, enabling EternalEnvy on his Morphling to not only farm his items, but also achieve a godlike killing spree. Na’Vi fell in one swift push at 33 minutes. The crowd was getting restless as they entered game three. Both Na’Vi and Cloud9 has a great deal of fans, some even cheering for both. Na’Vi went heavy push with Death Prophet, Nature’s Prophet and Shadow Shaman, whereas Cloud9 favoured a more teamfight oriented draft. First blood went the way of Cloud9, just as it did in the previous two games. It began slowly at first. Cloud9’s Bounty Hunter kept tabs with his Track ability on all the Na’Vi heroes, ultimately making them easy pickoffs for bOne7 and his Clockwerk Hookshots. There was very little Na’Vi could do when bOne7 pounced on his prey, as the Skywrath Mage would ensure the kill with a well placed Mystic Flare. Na’Vi had lost control of their own side of the map, and Cloud9 took full advantage of it. The final blow came when bOne7 landed a three man Hookshot into Cogs, ensuring three clean kills on the side of Na’Vi. With no buybacks and little to no moral, Na’Vi conceded defeat at 31 minutes. It would mark the first International where Na’Vi never reached the grand finals. Just as fans finished reeling from the previous best of three, the next was already being prepared. Game one of IG vs LGD and both teams draft a mixture of teamfight and pushing heroes; neither team had any visible advantage off the bat. That changed when LGD picked up first blood, and began to capitalize off of it with towers and ganks. IG attempted to recover with a try at Roshan, and even though they managed to snag him and the Aegis, they lost three of their heroes when LGD came to contest. LGD didn’t stop there either, and went directly to the second tier of towers to tear them down. Before long LGD were knocking on IG’s door, and there was little IG could do to stop the momentum. GG at 32 minutes. Fearing elimination, IG opted for an aggressive draft in the second game. It paid off too; and shortly into the match they secured first blood and an early tower. They kept the momentum rolling, with great Chronospheres from Faceless Void in combination with Invoker’s Sunstrikes. Anything caught attempting to flee the scene of battle was mercilessly chased down by IG’s Viper and his debilitating poison attacks. An ugly engagement mid caused the death of all but one of LGD’s lineup, giving IG and easy tier two mid lane. Similar to the prior game, IG turned their eyes to LGD’s precious base. Even though LGD pushed the first attack back, they were beaten and broken; IG forced a third game at 33 minutes. This was LGD’s chance to secure revenge on IG for knocking them out of a grand finals place back at TI12, and they sure meant business in game three. IG took a promising first blood, but it was immediately met with retribution from LGD. Their Centaur Warrunner and Vengeful Spirit worked in tandem across the map to bring LGD kills on important cores such as Faceless Void and even the tanky Bristleback. This gave Ember Spirit and Viper the much needed room to free-farm, and build up an impressive assortment of deadly items. At around the 40th minute, LGD were barreling down bottom lane for the kill, and they knew they had the game in the bag. Rabbit’s Centaur even does a little pre-win victory jig to the horror of IG’s fans. IG called it quits at 45 minutes in, and with it the last remaining International champion team left the tournament. We were guaranteed a new winner this year. The start of the game could’ve fooled anyone into thinking Cloud9 came out ahead. They narrowly scored first blood on the top lane to a suicidal dive from Batrider. His antics didn’t stop there, as he constantly harassed Sand King by disrupting his jungling and stealing the majority of his creeps. Even with this set back, VG’s fy on Sand King managed to secure a sub ten minute Blink Dagger; a key tool in his initiation toolbox. With their initiator at full effectiveness, VG went on the offensive. Time and time again each fight would result in no real advantage for either team. It was only when VG forced the issue at the tier three tower midlane when they finally came out on top. Their Bristleback was disgustingly hard to kill, and every second he was alive he was spamming the Cloud9 lineup to death with his Quill Spray. After a teamfight inside their base left Cloud9 with only one hero left, they were forced to call the GG at 40 minutes, knowing that the next day they would be fighting against elimination once again. The best game of the day has to go to this one. DK entered the game with a commanding lead thanks to an early first blood. LGD had little to counter the constant push in every lane thanks to DK’s pesky Nature’s Prophet. What’s more is that LGD came away from nearly every fight worse for wear when they tried to defend. Before long they found themselves inside their base trying to stem the incoming onslaught. They did manage to repel DK, but at the cost of all of their top and middle towers and barracks. The pressure was on thanks to the incoming mega creeps, and LGD knew they were in a bad spot. But after finding a miraculous pick off on the toplane while DK’s Templar Assassin and Rubick tried to gank LGD’s Lycan, they threw their might down the middle lane. It was all or nothing; the final fight. LGD quickly dispatched of DK’s middle barracks, before sending in their Batrider to drag back DK’s Enchantress to her death. 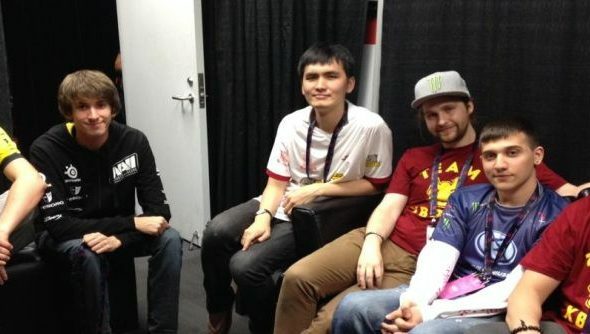 Mushi on Templar Assassin tried to intervene, but was met with the full strength of the LGD lineup. Even with his incredible lifesteal sustaining him, he eventually fell with no option to buy back. DK tried in vain to base race LGD with their Nature’s prophet, but it was no match. LGD pulled it back from the brink of a loss, and could sleep easy that night with a game under their belt. You can watch the full match here.